Am 12.6. (Samstag) ist die Werkstatt von 11 bis 17 Uhr geöffnet – wenn ihr größere Schraubprojekte erledigen wollt, kommt doch vorbei. Es gibt auch wieder Cupcakes und andere Leckereien. An dem Wochenende ist auch Bauwochenende auf dem Schwarzen Kanal, das heißt wenn ihr beim Bühne bauen, Wagen renovieren usw. mithelfen wollt, seid ihr auch herzlichst willkommen! Bis dann! PS Am Mittwoch ist die Werkstatt ganz regulär von 15 bis 18 Uhr offen. Next Saturday (June 12) the bike workshop is open from 11am to 5pm, for all your time-taking bike repair projects (and all others too of course). There will be vegan cupcakes, and sunshine, as we‘ve heard from the weather forcast. 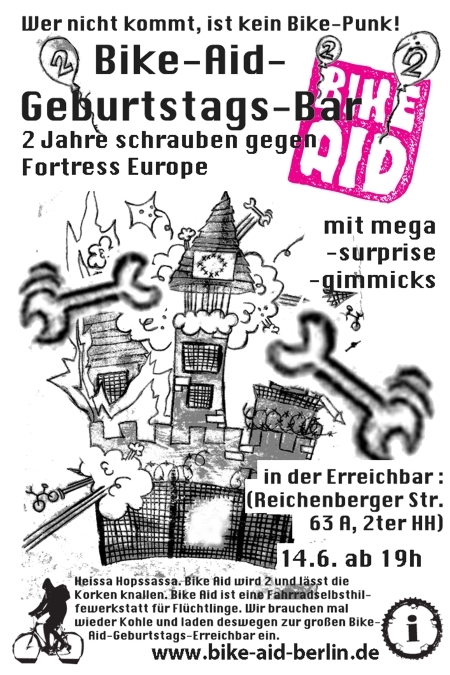 That weekend is construction weekend at Schwarzer Kanal as well, so if you wanna help out building a stage, renovating wagons, etc, you‘re also very welcome. See ya! PS On wednesday the workshop is open as usual from 3 to 6 pm. heissa hopssassa. bike aid becomes 2 and pops the corks! bike aid is a bicycle-diy-workshop for refugees, existing since 2008 at the wagonplace schwarzer kanal. we need urgently money and thought thats a good occassion for making a big party. whos not showing up is no bike punk. honestly. Du browst gerade in den les lanternes rouges Weblog-Archiven nach dem Monat Juni 2010.